Looking for a comprehensive pre purchase inspection in Newcastle but don’t want to spend a fortune? We’ll send a local industry recognised RBI expert to inspect your property. Your inspector will zero in on any potentially expensive problems and provide a concise condition report to assist in your purchase decision. Expert inspectors: Our inspectors are all qualified tradesman and licensed pest inspectors. Want to be present? Sure! Feel free to watch the Inspector in action. At the end of the inspection – at your request – our inspector will be very happy to walk you through the report. If you’re planning to buy a property, our condition report is designed to give you all the information you require to make a well-informed and considered decision on whether to buy the property or not. Our reports are drafted according to the Australian Standards and Quality Guidelines and are recognised by the real estate agents, as well as solicitors, in Newcastle. Despite being told by the estate agent that the property you’re considering is in “brand new” or “excellent” condition, it is a good idea to get an industry expert to give you a second opinion. The painted areas could be concealing flaws or rotting frames that may require expensive repairs and maintenance. Our Ipswich inspector will safeguard your investment by looking out for defects and coverups to find out the extent of the damage. Our inspection team will bring with them all the equipment required such as specialist devices, powerful torches, ladders, etc. to inspect all the areas that are visible and they will also make use of thermal and radar equipment to check the insides of the walls for the presence of any moisture, leaks and termites. And, all these services are included in the base fixed cost and you will not be charged anything extra. Usually, pest inspection involves tearing out portions of the wall, which can be quite messy and cause a lot of disruption. And, often the nesting areas that are deeply housed are missed, which can have serious consequences in the future. Our specialist team of inspectors make use of state-of-the-art technology that has been designed to specifically detect pests without causing any damage to your property. We make use of a blend of radar, thermal and moisture technology that enables us to look through the walls, floors and ceilings of the property without disturbing anything at all. Our Newcastle pest inspector is trained to use the Termatrac equipment that can detect and locate the precise location of termites without requiring to penetrate the walls, ceilings or floors physically. The inspector will inspect each and every part of the property that is accessible and visible to detect any current and potential termite nesting areas. Once the inspection is complete, we give you a condition report that is prepared as per the Australian Standards AS4349.1-2007 and AS4349.3. This report is written in a very straightforward and easy-to-read manner, and conforms to the legal requirements. The report will highlight all the things you need to know about the property including any expensive repairs that you may have to undertake, safety hazards, etc. along with photographs, so that you are able to understand all the problem areas without any hassles. Call ☏ (02) 4920 1128 to get a sample report. The reports that we draft for you, i.e. the pre-purchase building report and the pest report are in accordance to the Australian Standards AS4349.1-2007 and AS4349.3. The reports are fully recognised and are acceptable by an estate agent or solicitor. The report will highlight all potential issues that may place your investment at risk, which you can use to negotiate with the seller or as a reason to terminate your contract. So, essentially this means that you can buy your new home with complete confidence of knowing that you are getting nothing but the best for the price that you’re paying. Request pricing or book your inspector. Some of our clients were kind enough to let us video some of the issues that we found. Check them out! Why Choose Rapid Building inspections Newcastle? While training is great, nothing beats industry and real world experience! Every inspector has many years of experience in the building and construction industry and is a licensed pest inspector which means they are experts and will be able to spot issues less experienced inspectors could miss. We are active members of the IBC and strive always to improve our capabilities in order to server you better in all your building and pest inspection needs. Our inspectors are fully trained and qualified to Australian Standard AS4349.3 and follow all industry best practices, and are authorised to inspect throughout New South Wales. Your building and pest inspection from RBI is backed-up by our professional indemnity insurance up to $5,000,000 – we won’t need it, but you have the assurance you need that you are fully protected. You can be onsite when the inspection is taking place. That way, you can talk to the Inspector directly and discuss any issues. However, we do ask that you allow the inspector to conduct his inspection unhindered and save questions until he is finished. This helps to ensure a thorough and uncompromised report. Our expert RBI inspectors all carry the ‘Termatrac T3i’ and ‘Tramex Moisture Encounter Plus’. These devices can precisely detect, locate and confirm the presence of termites without needing to physically penetrate any walls, floors or ceilings and more importantly, it won’t disrupt or displace termite activity. The ‘Remote Thermal Sensor’ can pin point significant heat sources generated by termites within conventional building structures and the Termite Detection Radar accurately detects and confirms the presence of termites in the suspect areas. It can also trace and locate termite nests and entry points. Using a calibrated radar signal, this device can identify termites through timber, brick, masonry, concrete, plasterboard, plastic and other common building materials. No more holes in walls, and no need for tapping or prodding. And because the termites aren’t disturbed, they remain active for easy and accurate detection by the Termatrac Termite Detection Radar. The moisture sensor built into the ‘Termatrac T3i’ hand-held unit can measure and record differential moisture levels in building materials without damaging them. It can identify potential termite risk areas by the concentrated presence of moisture in most surfaces including wood, plasterboard, roofing, plastic, brick and concrete. Our inspectors all carry the ‘Tramex Moisture Encounter plus (MEP)’. It is a non-invasive overall building inspection moisture meter. It’s fast, precise and versatile! It can measure and evaluate moisture levels through paint, wall coatings, plasterboard, ceramic tiles, floor coverings, wood, roof coverings and ceilings. As we know the report is time sensitive, once payment is received, we will to get it to you within 24-hours, or your money back. But just because we’re fast, doesn’t mean we cut corners! Every pre-purchase building and inspection report has to pass a stringent quality review from our head office before it’s sent to you. Our business model means we can provide the best price in each region. If you can find a lower comparable price, send us a copy of the written quote and we’ll price match it! *1 No refund will be applicable if the payment for the report has not been received within 24-hours of completing the transaction. *2 The price must be for the exact same service we are offering, with the same equipment in the same geographical region. *3 While all RBI inspectors carry thermal sensor and moisture detection devices, these devices are only deployed where the inspector identifies conducive conditions and further investigation is warranted. *4 The 24-hours guarantee applies on completion of the inspection. We guarantee the most affordable prices for our services and we offer you a completely balanced pre-purchase report that will give you a true picture of the condition of the building, the presence of pests, etc. Our team of inspectors are completely impartial and maintain minimal contact with the estate agent and seller. They are here to get the job done and submit the property report to you quickly. All we require is complete access to the property at the agreed time and in case there is any change, we can reschedule the inspection if you notify us 24 hours before the appointed time. Inspectors are available weekdays and available weekend at special request. We’re happy to answer all your questions – even the hard ones. So give us a call today, and get the information you need from one of our team members. Report is 100% recognised by 3rd parties. We take our inspections seriously and provide thorough checks that are above and beyond the norm. Visual inspection of gutters and tiles looking for structural damage. Look for insulation and timber/structural related issues. Please make sure we have access so we can check. Check for moisture, mould, cracks a pest evidence. Look for favoured pest habitats. Look for holes, termite mounds and moisture and inspect greenery near walls. Inspect visible subfloor areas for cracks, structural damage, rotting timber and evidence of leaks. We’re located in Newcastle and service CBD, North Newcastle, South Newcastle, and everything in between. Just give us a call and we’ll send over one of our Newcastle inspectors ASAP. What does rapid mean? It means fast dispatch and a guarantee of not missing the appointment. Your report is in your in your hands within 24 hours of the inspection or your money back! When can you do the inspection? We always endeavour to make a slot available to you at the earliest convenient time, we never turn away work. Could I attend the inspection? You can be on-site when the inspection is taking place, that way, you can talk to the Inspector directly and discuss any issues. We do ask, however, that you allow the inspector to conduct his inspection unhindered and save questions until everything is done. This helps to ensure a thorough and uncompromised report. Do you check the loft and roof? As long as our inspectors are able to gain access. This is another way we provide best value Building Inspections in Newcastle. What is included in the report? 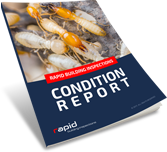 The report includes either a building inspection report, a pest inspection report or both, all in easy-to-understand English. How soon will I receive my report? You’ll have your report within 24 hours of the completed inspection provided payment has been received, or your money back! Can I rescind my contract based on your findings? Our condition reports meet current Australian Standards and are therefore recognised by real estate agents and solicitors. As long as you have special conditions in your contract, RBI’s condition report is known as proof. What happens after I book an appointment? Our RBI concierge will confirm with you the details of your property, and will dispatch the RBI inspector at your confirmed access time.